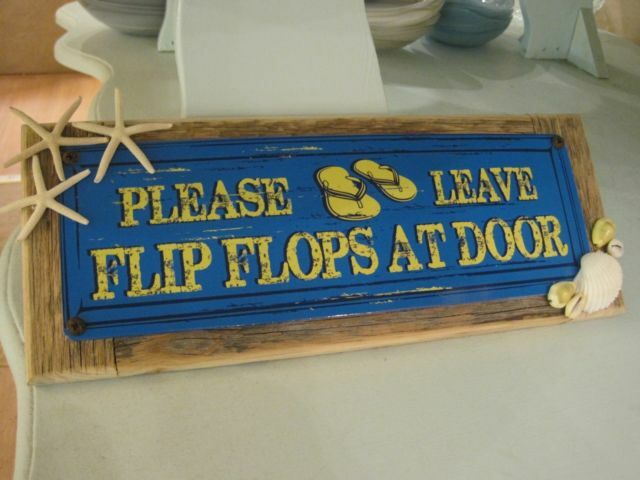 13 1/4" x 5 1/2"
This beachy sign asks for a simple summer request: “Please Leave Flip Flops at Door!” The adorable sign has the phrase beautifully spelled out on this awesome sign with deep turquoise and bright yellow colors and little flip flops graphic. The pretty metal sign is mounted on a 100% solid, heavy rustic, weathered wood – sturdy and durable! To make it extra special with that real seaside touch, I’ve added a lovely collection of mini white starfish at the top left corner and a pristine white ark shell and whimsical yellow cowries as accents to the yellow lettering. The sign has a sawtooth hanger on the back for easy hanging. The sign measures 13 1/4 long by 5 1/2 wide and 1/2 inch deep. Perfect for a beach house, a regular house, or any place you want to tell those beach lovers to keep the sand outside! It’s a great high quality piece to add to your coastal decor in your beach house or regular home! Makes a great gift for anyone who loves the beach!